The HOGG AGM will be held during this meeting. Please note it will now take place at 3.55 and not at 12.45, as previously advertised. At a meeting of the Geological Society of London on 18 December 1912, Charles Dawson claimed that a workman at the Piltdown gravel pit had given him a fragment of a skull found four years earlier. Revisiting the site on several occasions, Dawson recovered more fragments of the skull and half of the lower jaw bone. 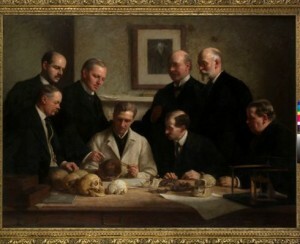 Arthur Smith Woodward, keeper of geology at the British Museum, announced at the meeting that a reconstruction of the fragments indicated that the skull was in many ways similar to that of a modern human and proposed that Piltdown Man represented an evolutionary missing link between apes and humans. The significance of the specimen remained the subject of controversy until it was exposed in 1953 as a forgery, consisting of the lower jawbone of an orangutan deliberately combined with the skull of a fully developed modern human. The Piltdown hoax is perhaps the most famous forgery ever to have been perpetrated.